Sign Me Up to Receive My Free Gift! What if they cut my phone line? Should I Install a Monitored Smoke Detection System if I already have Battery Powered Smoke Detectors Through out my Home? 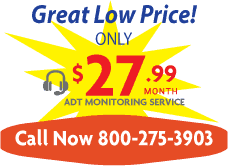 Is it True that I can Receive a Discount on my Homeowner’s Insurance if I Have an ADT Monitored System Installed? Should I have Window Contacts Installed with my Security System? Why is the ADT Logo the most Respected and Most Effective Burglar Deterrent in the World? What is Two-Way Voice and How Does it Work? What Brand of Home Security Equipment is Best? Should I pay for my security system up front or should I finance the purchase of my system with a 36 month agreement?